1. Get to the Home screen and touch Apps to begin with. 2. Touch Messages to proceed. 3. Touch the Menu icon at the upper right corner of the Messages screen (represented by three vertical dots) . 4. Scroll down and select Settings from the Menu drop-down options. 5. Scroll to Delete Old Messages to turn the feature on. 6. Under Delete Old Messages screen, touch Text message limit, to set the number of messages per conversation. 7. Scroll to the desired number of text message limit. 8. Touch OK to confirm text message limit input. 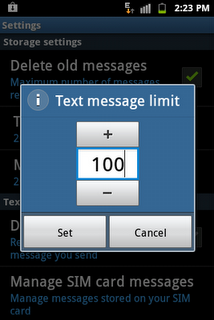 You should now be seeing the Text Message Limit number has already been changed to your desired number. Your phone will now automatically delete old messages from your inbox.